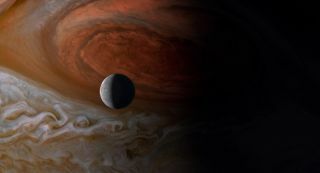 The moon Europa is dwarfed by its parent planet, Jupiter, in this image from the movie "Voyage of Time: The IMAX Experience." Terrence Malick's new film "Voyage of Time: The IMAX Experience" is a visual journey through the history of the universe — and it's overflowing with inspiration, even if it's a little short on information. The movie is most accurately described as a documentary: It features amazing footage of stunning nature scenes, like incredibly close shots of blue whales in the wild, some breathtaking cosmic "landscapes" captured by the Hubble Space Telescope and computer simulations of even more vast cosmic structures. For example, the movie's timeline arrives at the moment when life first emerges on Earth (illustrated by some very vivid computer simulations of microscopic life-forms dividing). But rather than talking about the chemistry that might have made this happen, the narrator meditates on death and its role in propelling life forward. And the evolution of more advanced life-forms prompts questions about the nature of consciousness — for example, did dinosaurs have the same kind of self-awareness as humans?). These pit stops in time are all covered fairly briefly, and through images as much as words. "Voyage of Time" departs from the traditional science-documentary format and delivers fewer facts than many other IMAX science movies, and there's not necessarily anything wrong with that. Science stories (including documentaries) seek to inform, engage and inspire audiences. "Voyage of Time" seems to aim almost exclusively for inspiration. By taking a highly artistic approach, Malick may succeed in planting the seed of curiosity in the minds of people who aren't inspired by other science films. Cooling lava, oozing across the surface of the Earth, in the movie "Voyage of Time: The IMAX Experience." One of the film's producers, Sophokles Tasioulis, studied aerospace engineering and has worked on multiple science and nature documentaries, including "Earth" (the 2007 feature-length version of the BBC TV documentary "Planet Earth") and "Deep Blue" (the 2003 feature-length version of the TV series "The Blue Planet"). "What is really gratifying for me, coming from an engineering background … [is] seeing art meeting science in such an impressive way," he told Space.com. "That's something that really makes me proud to be a part of [the movie]." The movie "Voyage of Time: The IMAX Experience" looks back at the history of the universe, and into the future, when Earth's atmosphere will likely be stripped away by the expanding sun. Tasioulis said he thinks the film could inspire people who have a "hesitation or a fear" to learn about science, because the movie provides "a very emotional way to get involved in the subject matter." At one point in the film, the narrator (actor Brad Pitt, who is also a producer on the film) briefly touches on the existence of dark energy anddark matter (although they aren't identified by name), while the screen shows a large-scale simulation of regular matter in the universe, which forms a web-like structure. Pitt ruminates on the idea that most of the stuff in the universe is invisible to us and that the world we see is "the tip of some cosmic iceberg." That's the kind of tantalizing tidbit that can keep a scientist up at night, or inspire someone to dedicate their life to pursuing these big questions. "I think, a lot of times, in a lot of documentaries and a lot of other forms of communicating, facts can be forgotten very quickly, whereas curiosity will linger," Nick Gonda, one of the film's producers, told Space.com. "And I think if this film accomplishes anything, it is the way that it inspires the individual to be curious about the world and the universe that we live in." He said he hopes that after people see the movie, they visit the movie website or other websites where they can learn more about the subjects covered in the movie. The movie is dominated by scenes that take place on Earth, but it does include some amazing cosmic views that can more readily be appreciated when they're blown up to the size of an IMAX screen. Some of these images were made entirely by the IMAX visual effects team, others utilized simulations built by scientists, and some relied on photographs from the Hubble telescope. For a space fan, even a few minutes of those stunning visuals are worth the price of admission. Even viewers who don't care for the abstract style of the narration should have no problem sitting through 45 minutes of an incredibly vivid visual tour of the universe and the planet we call home. "Voyage of Time" opens in select theaters Oct. 7.